Like a broken record, the winter weather goes on and on. And with two broken ribs, the discomfort continues on as well. So, I’m repeating a very early blog I posted from around this same time of that year. So many followers and readers have joined me since, so it will be new to most. The calendar says it is Spring but the weather keeps denying it. Recently, I’ve been daydreaming of all the beautiful greens of Spring. I thought how that color family is also a popular interior choice as well. Beginning decorators are especially drawn to warm greens, perhaps because we see those everyday in nature. Greens are comfortable for guys and gals alike. They are great companions for woods, stone, ceramic and natural accessories. It’s also very easy to find coordinating fabrics that will also give you additional accent colors to use with your greens. Choosing colors to use in your home? Does the very thought of it put worry wrinkles on your brow or get your stomach growling? Would it be easier if you only had to pick one color … just one? For those who worry and fret over paint color decisions, a monochromatic color scheme is an easy and safe design approach. This simply means choosing ONE COLOR, but then working with several tints and shades of it, to provide your differences and interest. Below is a wonderful example. Beautiful design here. Notice how interest is brought in with varied patterns and textures, which is another way to enliven any room, but especially with monochromatic schemes. It’s almost that easy … but not quite. You need to be aware of two factors for any color schemes, but especially with monochromatic. Be conscious of and able to recognize that every color has a warm and a cold version, and for the most part, colors from one don’t work well with those in the other category. Coincidentally, individuals tend to prefer either one or the other. And wherever you are painting, first make note of the lighting options in all of your areas. Windows come to mind immediately, but also notice which directions the window’s light comes from, and at what time of day it is most effective. Also remember your mechanical options; overhead and cans, lamps and task lighting. Above they’ve chosen to use the same color on every wall area, and bring in the lighter and darker tones with accessories. 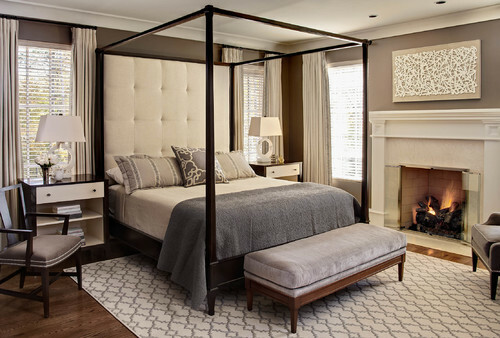 A beautiful look, but the room would also be a perfect candidate for a more developed monochromatic scheme. The recessed alcove and it’s interesting layered opening are perfect opportunites for varied tints and shades of the main paint color. A MCS works in rooms of any function and size. 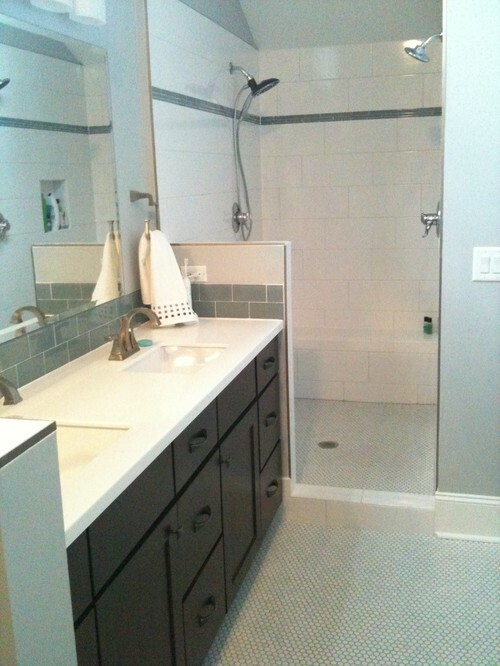 This bathroom is a great example of how to utilize a monochromatic scheme. Here literally everything is rectangular, the shape of the room itself and all in it. This could be boring and bland, or overdone with too many colors. But by distributing tints and shades of gray, each area has it’s own identity yet nicely cohabits with its’ companions. Don’t miss the textures featured here. The very subtle color variances in the larger shower surround tiles. The shiny glass, smaller subway tile of the backsplash. The walls in different tones, and the dark wood vanity that grounds the room. Look closely and you’ll see a very small design in the flooring. A great way to accent everything AND unite the room, is their use of the strips and borders of smaller, dark gray tiles. Very nice. How about a different color. Granted, purple isn’t for everyone, but below shows a good way to place your tints and shades; darker colors in brighter lighted areas and vice versa. Note here that in the brightest corners by big windows, they’ve used the darkest shade of their color. The mid tone is mid-room and the lightest is in the bed alcove and on the ceiling. Very dramatic use of purple here. I applaud their bravado. Below is a dramatic corner in a monochromatic room. 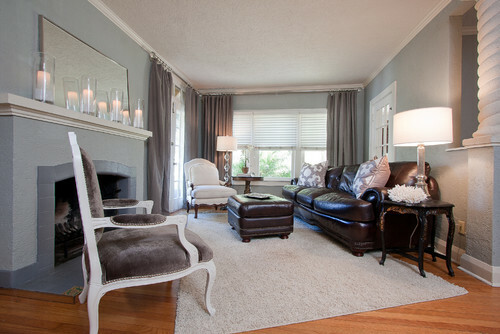 Contemporary Living Room by Cleveland Interior Designers & Decorators All Things Savvy, Inc. This isn’t my preferred look or style, but it is a nice area, and great use of a MCS. I especially like the ceiling treatment, with different colors on molding and walls. 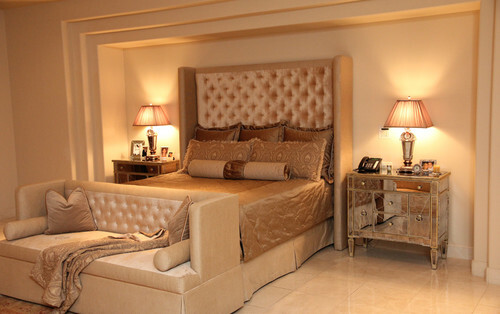 Details: note the interesting level at which the draperies are hung; the fun textures in the rug and pillow. And the varied patterns and piping of the chair. Even the decorative accessories on the side table coincide with the scheme, in textures and colors. How about a few living rooms? 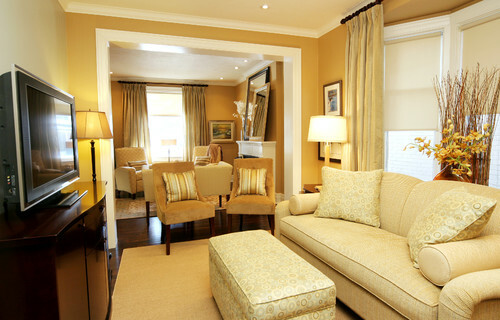 Traditional Living Room by Tampa Interior Designers & Decorators Peridot Decorators, Inc. I have this room in more than one of my HOUZZ ideabooks. I just feel good instantly, every time I find it. But it is also a great example of a MCS. It’s lovely and looks so comfortable. Just what a bedroom needs. Open floor plans are in so many homes today, either by new design or through remodel. The concept is very popular, and a huge selling factor. There are several reasons why I recommend using monochromatic schemes in these spaces. For builders, MCS can be both neutral enough to not be offensive to clients, but still interesting enough to be eye-catching, worth remembering. Any home for sale, whether new or existing, has to give the prospective buyers something great to remember when viewing so many properties. 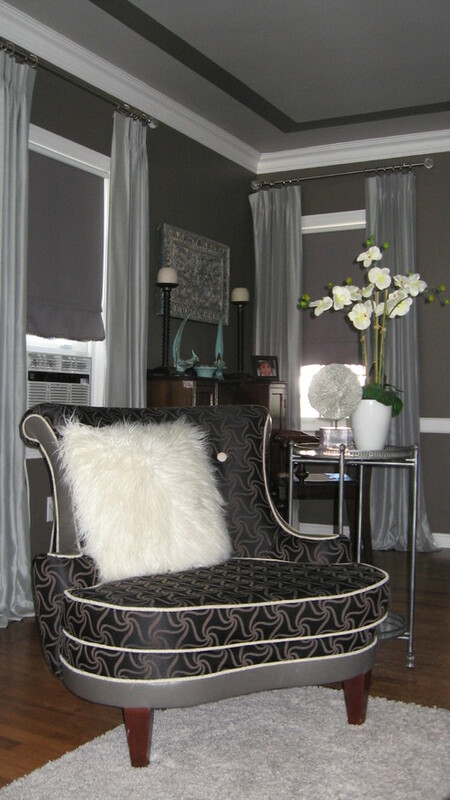 A monochromatic scheme is also much easier to work with, for first time, or inexperienced home owners. Tackling large spaces such as those above, can be worrisome for anyone, even decorators. This area has so many wonderful details in its’ design, that paragraph upon paragraph could be written. Instead, have some interactive fun. You tell me. How does this demonstrates a monochromatic color scheme? What details, textures and colors do you see here that work so well? Or perhaps you don’t feel this IS a workable space for you. If so, why not? Comment below and lets get a discussion going! Meanwhile, don’t stress too much about any project, just start and things will evolve. Thanks for visiting. 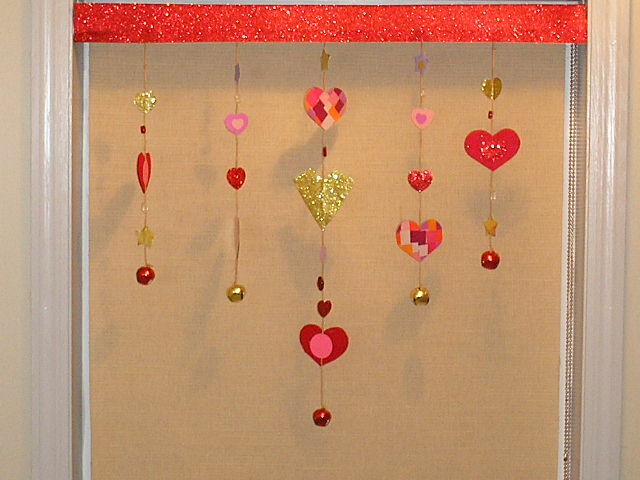 You’ve just read “Easy Color Schemes” my original article, first seen on Artzzle.com. I love comments and questions so send “em” my way. And be sure to spread the word about Artzzle to your friends. The more the merrier! Remember, all content on Artzzle, text and photography, is copyrighted and cannot be used in any form, without my expressed permission, or approval from material’s originator(s). You can leave a comment below with any questions on this.